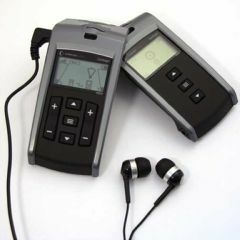 AllegroMedical.com presents The Comfort Audio Contego FM HD Communication System with Earphone & Headphone. Comfort Audio's Comfort Contego is a wireless, digital, secure high-definition FM HD sound communication system for people with mild to severe hearing loss. This version includes an earphone and headphone. Achieve up to approximately 40dB amplification at 1kHz. The Comfort Contego is the only wireless system that transmits high-definition digital sound over secure channels. This feature makes it a good option for those who desire a secure communication system that cannot be eavesdropped electronically (courtrooms, business, government offices, etc.). The flexibility of the Comfort Contego system allows an unlimited number of additional receivers to be used with one transmitter (additional receivers available separately), making this an ideal solution for guided tours, classrooms, courtrooms, etc. Both the transmitter and the receiver have built-in microphones that can be set for omnidirectional or directional depending on the environment. Comfort Contego is a practical solution for the work environment, such as in meetings, groups, seminars or lectures. At home, the system can be used at the dining table, while watching TV or with other sound sources. While out and about (in restaurants, the car, stores, etc. ), the system helps reduce background noise to focus on desired sounds. The receiver itself may also be used as a standalone personal listener. A telephone kit is now included for improved communication on the telephone! Working range is approximately 100 feet depending on the type of environment you're in. It can achieve up to 20 hours of use (under normal conditions). The Contego uses Li-Ion rechargeable batteries. This Contego system comes with an earphone and headphone. For t-coil hearing aid wearers, a Contego system with a neckloop is available. Two year warranty. Six month warranty on accessories. Digital Wireless System - Comfort Contego'sï¾„ï¾¢ digital transmission provides high-definition sound and clarity under a variety of conditions. Total Security - Comfort Contego's transmitter and receiver are automatically "paired" to provide secure coded transmission. Custom Sound - Comfort Contego provides maximum flexibility in all situations. Both the transmitter and receiver have internal zoom microphones that can be remotely adjusted for omni or directional use and volume setting. Easy to Use - Comfort Contego is small, lightweight and can be used almost anywhere. The easy-to-read LCD menu provides a clear system for settings and adjustments, ensuring quick setup. Modern Design - Comfort Contego features a smart and discreet contemporary appearance designed for form, function and discretion. Maximum Functionality - Comfort Contego is the basis for a total sound solution for individuals with hearing loss. The transmitter can be used with multiple receivers to create a secure hearing system. The receiver may be used alone as a personal listener by activating the built-in microphone. Comfort Contego can be linked to a television, sound system or other sound sources. It can be used by hearing aid wearers using a neckloop or with a headset or earbuds. Battery Powered - Comfort Contego uses Li-Ion rechargeable batteries that do not exhibit the memory effect and subsequent shortened life of other rechargeable batteries. 1 Telephone kit for improved communication on the telephoneWhat is an FM system?